Count On Tools Inc., a leading provider of precision components and SMT spare parts, introduces the new ezLOAD PCB Support System. With the recent increase of densely populated double-sided circuit boards, COT recognized the need for more affordable board support options in the electronics manufacturing industry. The end result is an innovative design that is not only easy to setup and install, but also offers industry-leading benefits to EMS companies and contract manufacturers worldwide. The new ezLOAD PCB Support System not only reduces changeover times, but improves product build quality, increases revenues by providing significant cost savings, and can eliminate component damage during the assembly process. The ezLOAD system features active grip technology to securely hold boards during the assembly process. It protects components while allowing the boards to move freely through the assembly line. With the basic universal design, there are no mechanical functions to fail on the ezLOAD system. It requires no air, electronics, or communication from the user. The magnetic locking base enables a quick and easy installation. Other base designs are available for machines that feature non-magnetic tables. The ezLOAD system is extremely durable thanks to the soft, flexible design, and is proven to be reliable after testing in the most hazardous conditions. If a support pad becomes damaged or worn, you can just pull it off and replace it. Most importantly, the ezLOAD PCB Support System is affordable compared to competitive products on the market. The new ezLOAD PCB Support System is simple to use. Just place the unit on your equipment's board support table and align as required. Multiple units can be arranged in rows (X & Y) for more support on larger boards. 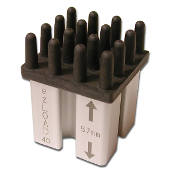 Our standard design features strong magnets that hold the ezLOAD system in place. We also offer other designs for machines that have non-magnetic tables. The ezLOAD PCB Support System is compatible with any SMT equipment, from pick-and-place to chipshooters, screen printers, dispensers, AOI, and more. The ezLOAD system can be customized depending on machine requirements, specialized components, or specific design application requirements. Customer Approved Testing in Universal Instruments equipment.